This wasn't the first time NBC has enlisted Kennedy to trumpet Obama's quest. Back in early March when the White House held a summit on health care, reporter Chuck Todd appropriated the coach who inspired "win one for the Gipper" by touting on NBC Nightly News how "the President's drive to pass health care got a Knute Rockne-like boost with a surprise appearance" by Kennedy. Senator Ted Kennedy is using his own battle against brain cancer to make an emotional pitch for health care reform. Writing in Newsweek, Kennedy called it "the cause of my life." He said "every American should be able to get the same treatment that U.S. Senators are entitled to." It's clear the votes aren't yet there for the President, so over the last week he's used his bully pulpit day after day to tell his plan, waging an all-out campaign to gain support, huddling with Democratic leaders and undecided Senators. And, after vulnerable Democrats raised red flags over the new tax and its impact on small business, warning it could "kill the goose that will lay the golden eggs of our recovery," the very next day found them all marching into the West Wing - invited to come vent their concerns to top staff. 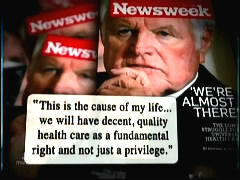 And today, another dramatic push, this time from an ailing Ted Kennedy, absent from Washington but appearing on the cover of Newsweek and writing: "This is the cause of my life. We will have decent, quality health care as a fundamental right and not just a privilege." And, [anchor] Carl [Quintanilla] , in another indication of the high stakes here, the President plans to have a formal prime time news conference in the White House's East Room on Wednesday evening.